WHAT MAKES MAGNETIC THE BEST CHOICE OF NAIL SCHOOL FOR YOU? We will never compromise our high standard of education! The comprehensive nail courses we offer in Johannesburg and Pretoria were designed in Europe and have been tried and tested over the last twenty years. All of our courses are taught according to the same methods and exacting standards that are expected in Europe and are also accredited by City and Guilds. We are also fanatical about hygiene and following best business practices. We teach all our students to work hygienically, orderly and cleanly in the Salon to protect themselves and their customers from any unwanted germs and fungal infections. All of our Nail Trainers are passionate about the Nail Industry and must have a minimum of five years experience working as Nail Technicians. Every year, all of our Trainers must attend a compulsory five day refresher course and a an International Train-the Trainer event, hosted by Magnetic Holland. All of this to make sure our Trainers are on the cutting edge so that you get the very best Nail Courses possible. Each Nail Trainer contributes to your success by providing product knowledge, application techniques and valuable post graduation assistance to enrich your nail technology skills. 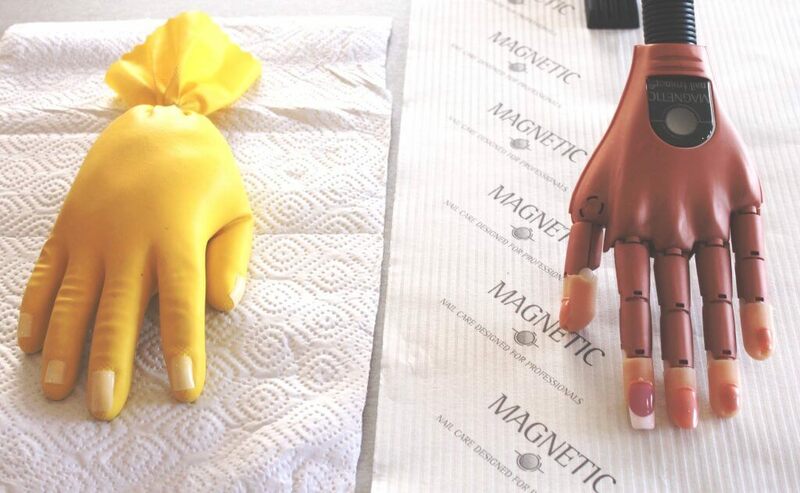 At Magnetic we do things very differently to the way many Nail Schools do. At the start of each course, every student receives a complete Nail Technician Kit that is tailor made to the specific nail course they are studying. Magnetic’s kit always contains full Salon size products. Most Nail Academies only give you sample products which run out during training. Then they catch you because now you have to buy more products just to finish your training. At Magnetic there are no surprises or hidden costs because your kit comes will all the tools and products to complete the course, do your exam and and begin your business as a Nail Technician. ALL NAIL PRODUCTS USED IN THIS ACADEMY CONFORM TO THE HIGHEST STANDARDS OF QUALITY. OUR PRODUCTS ARE MANUFACTURED TO COMPLY WITH ISO 22716: GMP FOR THE EUROPEAN COSMETIC INDUSTRY – GMP STANDS FOR GOOD MANUFACTURING PRACTICE. HOW DO I KNOW IF A CAREER IN NAILS IS RIGHT FOR ME? Magnetic has a quick, easy, risk-free way to answer that question. Every Saturday, we host a short Nail Technology Workshop, where we introduce you to one of the most exciting and fastest growing Industries in South Africa. We guarantee that by the end of this inspirational workshop, you will know if a career in Nails is for you or not. This workshop is FREE, FUN and, if you attend, you are under NO OBLIGATION to train with Magnetic. The five most important things to look for in a Nail Academy. Learn more about where the Nail Industry came from, where it is going and why it offer so much opportunity! 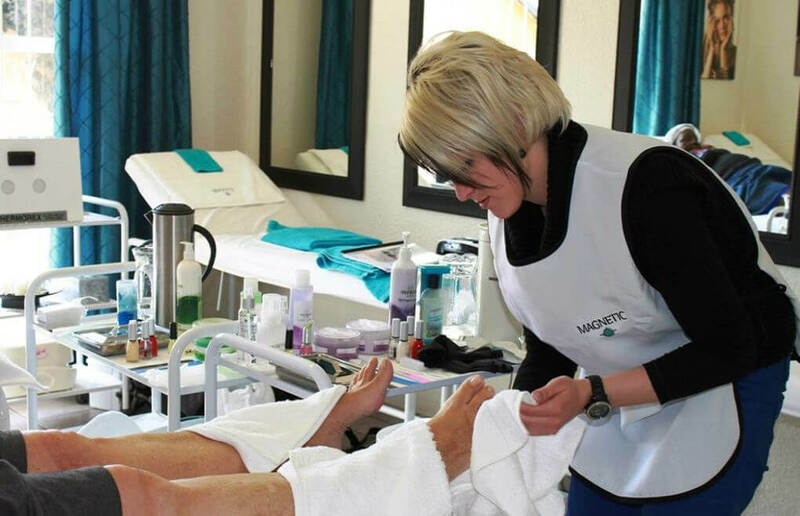 Find out how we help Nail Tech’s all over South Africa earn R1000 profit per day. Experience Nail Art Demo’s on your Nails. Find out how to “Train Now and Pay” later with innovative and revolutionary finance. So, what are you waiting for? Fill in the form below, and we will contact you to confirm your seat. Please note that these Workshops are small and seats are reserved on a first come, first served basis. For catering purposes please let us know if you are bringing anyone with you. # 5 OUR NAIL TRAINING METHODS ARE JUST BETTER! 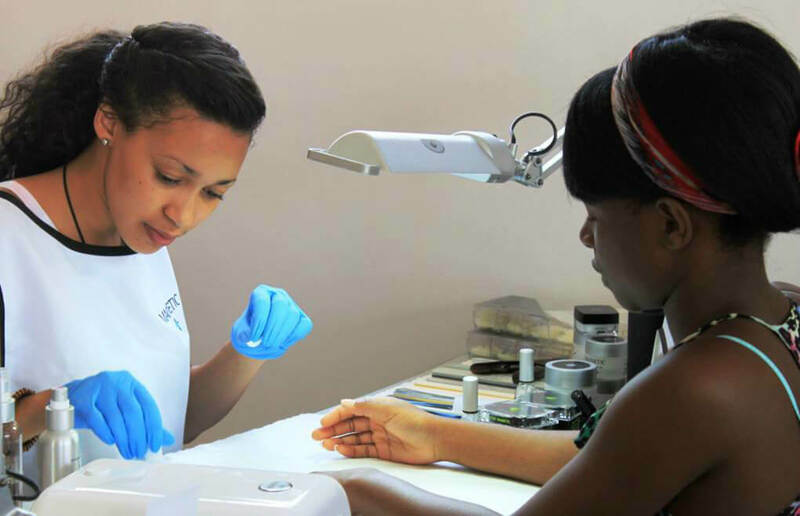 Magnetic is also one of the very few Nail College in South Africa that uses a “Nail Trainer” as part of the training process.Take a look at the Nail Trainer in the picture on the right, you can also see students working on the Nail Trainer in most of the pictures on this page. 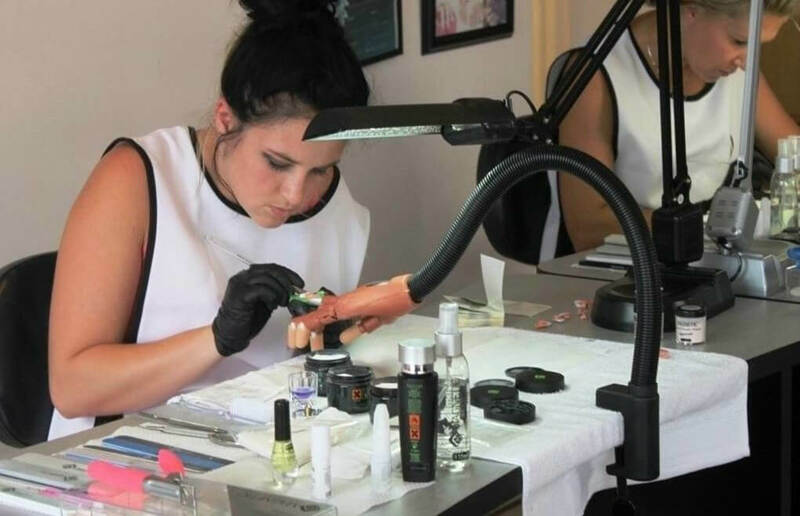 Students are first taught to master the Gel or Acrylic Nail systems on the Nail Trainer before they practice on live models. By the way, your training takes place in a dedicated school, unlike many Nail Schools, your training will not take place in a Salon while your Trainer does a set of Nails for her client. Many Nail Schools will do your training on a dish washing glove filled with flour and rice. (See the hand below left) At Magnetic, we use a Nail Trainer. (Below Right) The Nail Trainer is just like a real hand with proper joints, fingertips and nail beds. People are different and so are their nail beds. 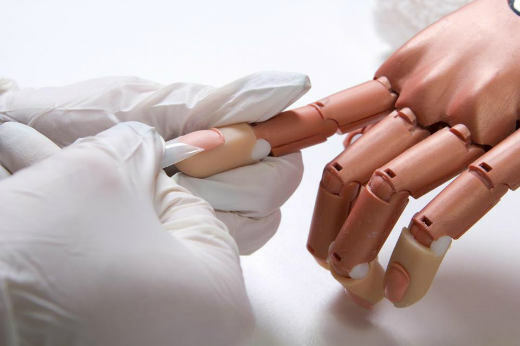 That’s why fingertips on the Nail Trainer can be removed and different size and shape nail beds can be attached simulating a real hand. Your initial training will be facilitated using the hand until basic techniques have been mastered. Then you move on to live models. # 6 DEDICATED NAIL TRAINING CLASSROOMS! Did you know that many schools facilitate student training in a working salon while the trainer sits doing a set of nails on a client. Training is interrupted by phone calls and passing trade. Because we are a dedicated Nail School, our Nail, Mani and Pedi classes take place in a dedicate nail classroom, with no distractions or interruptions in your education. You can see our actual classrooms in every picture on tbis page, but now we would like to extend an invitation to you to visit our Nail Academy and check out our classrooms. You will immediately notice the high levels of hygiene and professionalism because that’s how we want you to run your nail business. 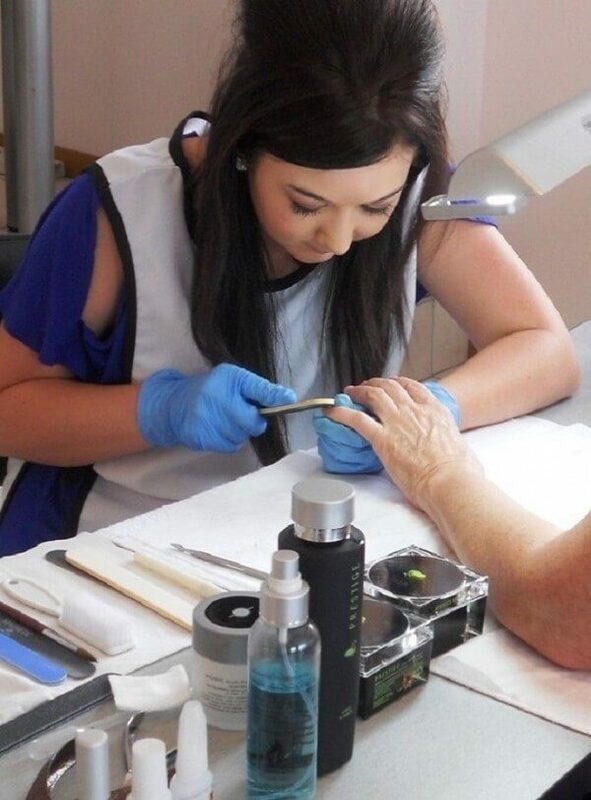 If you are serious about a career in Nail Technology, then come and visit us, ask questions, meet our trainers and have a cup of coffee while you get the information you need to make 100% certain that a career in nails is for you. After training with Magnetic, most of our Nail Technology Students end up opening their own businesses. We want to provide business support for all of our Nail Tech’s so that they make money and establish themselves in their particular trading area. Business is a team sport. – we don’t just want to train and supply Nail Techs we want to partner with them because our business philosophy is simple – if the Nail Tech’s and businesses we supply don’t succeed, we don’t succeed. That’s why all of our Nail Courses come standard with The Nail Tech’s step by step guide to finding clients, getting your diary full and making money. This is a revolutionary Marketing Course created by Magnetic that takes each Nail Tech through one and a half day’s marketing training that practically teaches you how to build a customer database, get your diary full and build a profitable salon. We cover word of mouth marketing, Facebook, email, mobile marketing and a lot more. The workshops step-by-step marketing strategies even come with ready-made customizable marketing tools that you can use at every stage of your business journey. Magnetic Nail Academy has the widest range of products and the friendliest staff who are more than willing to help in any way possible. The Marketing Course has taught me so much and by using the tools and Knowledge that Magnetic has shared with us has helped me double my client base.